Donald Trump is presiding over a national economy that, depending on whom you listen to, is either rockin' and rollin' or not as robust in many areas as the economies of some recent predecessors in the Oval Office. But state economies are clearly feeling the effects of the Trump Administration's policies and politics; some for the better, some for the worse. Documenting economic changes under Trump, as with any other president, is critical for several reasons. One of the biggest is that assessing the many factors that make up a state's gross domestic product (GDP) assists in avoiding faulty financial moves in the future. The GDP numbers are estimates that the Bureau of Economic Analysis (BEA) “derives as the sum of the gross domestic product originating in all industries in the state,” which can range from agricultural, forestry, fishing, and hunting to heavy manufacturing and government enterprises. The BEA uses an equation, including all 50 states and Washington D.C., to come up with the numbers: “GDP = consumption + investment + government spending + exports – imports,” which is based on 4Q 2016 GDP figures that are adjusted for inflation to 3Q 2018 dollars. The overall U.S. economy has been on solid ground since Trump took office, and Stacker finds that the wholesale and retail trade, and the finance and insurance sectors are the leading engines of growth in most states. Still, with trade war threats and one serious government shutdown already, many states are concerned about their financial futures. Connecticut was the country's slowest-growing economy over the time period Slacker studied, with a 0% change, while Washington State led the list at 15% thanks to a friendly business environment. California's financial footprint continues to get more massive: Its GDP now approaches $3 trillion, which would make it the world's fifth-largest economy if it were a nation, passing the U.K. Despite that, the Golden State's 7.97% growth didn't crack the top five. Read on to see where each state and the District of Columbia ranks in growth during the Trump Administration. Connecticut had a bad year economically in 2017, so its overall growth was stagnant in spite of growing quarter-over-quarter in 2018. In fact, Connecticut's economy has been stagnant for about two decades; and while the state consistently ranks among the five richest in the country, that's mostly because of its wealthy residents along the “Gold Coast” (lower Fairfield County). 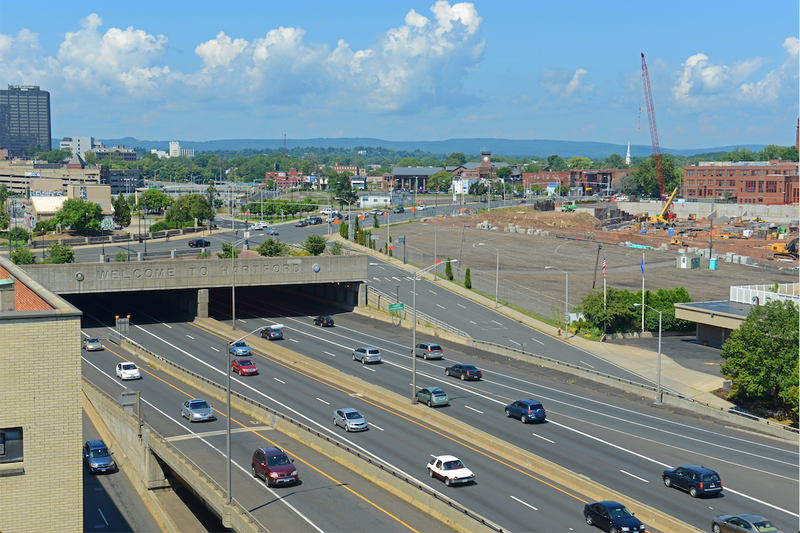 With the exception of Stamford (also in the Gold Coast), Connecticut's cities are largely depressed economically. Despite having one of the slowest growing GDPs, New Mexico's 0.69% growth in government and government enterprises in the second quarter of 2018 shows the Trump administration's positive influence on The Land of Enchantment. “New Mexico's economy leads other states in job and wage gains since President Donald Trump's Inauguration in January 2017, according to an analysis of Federal Reserve Bank of Philadelphia data,” reports Bloomberg. Retail trade was among the fastest-growing sectors in the Bluegrass State; however, President Trump's face-off with China over trade may change that. Meanwhile, the administration of GOP Gov. Matt Bevin touts good economic times despite the state's slowing income and limited workforce. “Gov. Bevin has sent a clear message that Kentucky is open for business, and the 45,791 new jobs and nearly $16.5 billion in investment announced since the start of the administration (in December 2015) prove that companies are choosing to invest in Kentucky,” a spokesperson for the governor said last September. Professional, scientific, and technical services saw the largest rise at 0.36% in the second and third quarters of 2018. Missouri was recently awarded a portion of the U.S. Environmental Protection Agency (EPA) Region 7's $51 million contract to provide scientific and technical support services to the Superfund Technical Assessment and Response Team (START V), which will further that sector's growth. Information and retail trade services also rose at 0.33% each in the Show-Me State. Some of the 1.5% rise in GDP in the construction, real estate, rental, and leasing sectors can be attributed to the University of Oregon, whose fiscal year 2017–2018 showed an economic footprint of approximately $2.2 billion. It is expected that some of the $518 million in general obligation bonds dedicated to construction jobs coming down the pike—including more university renovations and Department of Fish and Wildlife facility upgrades—will raise GDP a little higher. The finance and insurance sector rose 1.68%, giving Delaware a reported GDP boost in early 2018. The Trump Administration is making it easier for insurance brokers to sell short-term health plans in an effort to repeal the Affordable Care Act, and that may have spurred growth in the insurance sector. In November 2018, Forbes bumped Delaware up five spots in its Best State for Business rankings, reporting that because of its business-friendly corporate law, more than 50% of U.S. publicly traded companies reside in the state. Mississippi only saw a decline in handful of the workforce sectors, ranking highest in retail trade, yet the state remains economically depressed. USA Today recently ranked Yazoo City as one of America's worst cities to live in, reporting it has double the comparable national unemployment rate and is losing jobs instead of gaining them like the rest of the country. Furthermore, the jobs gained earn an average household less than $21,000 annually and keep 49% of Mississippi residents living below the poverty line. Although the finance and insurance sector posted the highest percentage increase at 0.8, it is the retail trade category at only 0.17% that helped boost the economy, with more than $561 million in exports to China. That led to around 5,600 new jobs last year. In an effort to enhance the economy and slight 2% GDP rise, Hawkeye State business leaders are signing onto the Iowa Compact on Immigration in hopes of presenting a welcoming and business-friendly state for newcomers to America. The wholesale trade and finance and insurance sectors dominated the slight rise in the 2.07% GDP, but the state's economy still suffered, managing to lose 1,700 jobs while maintaining a steady 4% unemployment rate. Growing 0.83% in two years, the construction sector helped push the $1.3 billion rise in GDP. Unfortunately, areas like Grand Forks have not seen any real difference in GDP, job growth, or sales-tax income while the rest of the state is experiencing a rise in those sectors. The good news for North Dakota is the economic impact of the booming oil industry, which is adding billions to the state economy while creating long-term employment. An op-ed in Fairbanks' Daily News-Miner warns that “Alaska's budget has been cut so much during the past five years that it is hurting our economy and endangering our residents.” It presents an eight-point plan to help Alaska prosper, including raising Alaska's royalty and production tax, creating competitive oil taxes, no longer handing out tax credits for oil exploration, and reinstating the state income tax. One answer to Alaska's economic woes from the Trump Administration: Open the Arctic National Wildlife Refuge to oil exploration. Louisiana's depressed economy has made it hard to live in The Pelican State, according to USA Today. It points out that Louisiana was one of only four states to see a GDP decline in 2017, and “among all 50 states, Louisiana is the worst place to do business.” Recently, a former Louisiana congressman was tapped by the Trump Administration to be an assistant secretary of commerce for economic development. Although the educational sector accounted for only a 0.05% bump in Arkansas' overall $3.1 billion GDP increase, the University of Arkansas's contribution to the state economy surpassed $2 billion in 2018. Still, like many other states, Arkansas foresees a bleak future based on the U.S. Chamber of Commerce's projected effect of retaliatory tariffs by Canada, China, Mexico, and the EU. Wholesale trade, which added 1,000 new jobs to Ohio in 2018, along with finance and insurance, helped boost GDP most. However the increase in jobs does not bring much hope based on a Bloomberg report on the Buckeye State. The agriculture, forestry, fishing, and hunting sector put a serious drag on the economy, showing a -0.18% loss during the middle of 2018. In 2018, Gov. Mark Gordon signed a law allowing for the regulation, cultivation, and sale of hemp-derived CBD, which it is hoped will boost the state's slow-growing economy. Meanwhile, the mining, quarrying, and oil and gas extraction sector subtracted -0.67% from GDP in the second quarter of last year. Like Alaska and West Virginia, Wyoming is one of three states in which the mining industry has been a drag on GDP. Nebraska's economy has been up and down but saw a strong finish in 2018, buoyed by a 0.55% increase in the finance and insurance sector. The agriculture, forestry, fishing, and hunting sectors may have tied with the retail trade sector at 0.38 % GDP growth, but a seriously declining farming industry slowed the state's overall growth. Despite that, Omaha ranked #28 in U.S. News & World Report list of 125 Best Places to Live in the USA. South Dakota's 0.67 % rise in the finance and insurance component of its GDP is consistent with its 2015 GDP rise in the same sector. The Atlantic reported in 2013 that the state held $2.5 billion in Citibank assets, making it the U.S.'s top state for business. Despite a sluggish overall economy due to tightening labor markets and a tough environment for farming, construction and building investments keep the state economy growing. A failed tax cut experiment for the wealthy by Gov. Sam Brownback, similar to the Trump Administration's $1.5 trillion tax cut, has Kansas trying to keep its head above water. Because of tax cuts for the wealthy, middle-income Kansans have suffered slashed services in education, transportation, health care, and agriculture, exacerbating economic inequality and leading to sluggish GDP growth. Federal tax policy overhauls in trade, along with tariffs imposed by the Trump administration, are weakening the North Star State's economy. There has been a -0.92% downturn in the agriculture, forestry, fishing, and hunting sectors, and farmers are fighting for survival. The farmers' plight has been so severe that the Minnesota House of Representatives has set aside funds for mental health counseling for the farm families facing hardship. With a 3.86% rise in GDP and the state's labor secretary promising profitable times ahead, Alabama finds itself in the middle of the pack in terms of growth. Wholesale and retail trade remain the fastest-growing sectors in the state, while technical, automotive, and aerospace jobs are increasing rapidly in Huntsville. That helps to average out lagging labor force growth across the state. However, with its manufacturing costs at fifth-lowest in the nation, Alabama may see brighter days ahead. A sluggish 2017, highlighted by two quarters of loss, landed Montana in the bottom 10 for the year, but the economy recovered strongly in 2018, with average quarterly growth in GDP of 4.1%. Agriculture continues to be one of the state's top economic drivers and employers, with more than two-thirds of the state's land dedicated to farming and agriculture. Virginia's politics have not helped the state economy, with some local leaders' personal scandals causing a distracting strain. Still, the more than $20 billion difference in the state's real GDP and the fact that aerospace and defense manufacturers call the Commonwealth home foretell a more stable economy ahead. The Economist's prophesied big things for Indiana in 2018, and the Hoosier State delivered with 3% growth in each quarter after a sluggish 2017. As in many other states, wholesale and retail trade, plus finance and insurance, spurred its economy. If all goes well as some suggest, Indiana may have an economic output boost of 3.2% in the 2019 fiscal year driven by business investments recently stoked by tax cuts. The Garden State is getting a bit greener as seen in the more than 4% rise in GDP, but 1 in 10 families remains below the poverty line. Nondurable goods manufacturing at 0.46%, wholesale trade at 0.7%, and professional, scientific, and technical service sectors at 0.41% helped boost the state economy the most, while losses in mining, utilities, and construction subtracted from overall growth in the second quarter. Meanwhile, South Jersey saw a unexpected rise in the gaming industry after a long slump. In late 2018, Pennsylvania's wholesale and retail trade sectors pumped up GDP growth, which had been topsy-turvy since Trump took office. Growth in manufacturing helped the Lehigh Valley post its highest output ever, while the economy got further support from such key industries as tourism, life sciences, and agribusiness. Texas economists see a silver lining despite slowing economic growth, as the Lone Star State's GDP rose to the tune of $70 billion. A stronger workforce may be needed to support the surging mining and construction sectors, which, respectively, saw a 0.33% and 0.32% rise in the second quarter of 2018. Wholesale trade was the state's largest-growing sector, maintaining 0.79%. Reports suggest that while almost fully restored from the 2008 recession, Wisconsin still struggles with poverty-level wages, despite a 4.21% rise in GDP. Bank loans and earnings provided a boost to the state's economy. In turn, the banking industry assisted small businesses growth, further enhancing the state's economic development. North Carolina has been considered one of the least economically healthy states over the past decade, and it's 1.8% growth in the third quarter of 2018 was 47th among the states. Republican claims that the state is just fine are also not being accepted by those that claim new businesses coming into the state are only offering low-paying service jobs. One thing that is for sure is that the home furnishings industry continues to feed the state billions. The Pine Tree State's economy saw ups and downs in in 2017, growing just 1.9% for the year, well below the national average. After a sluggish start to 2018, Maine's economy recovered during the second quarter, with 3.4% growth, thanks to the real estate market. Labor shortages have long plagued Maine, but a higher minimum wage and some population growth give reasons for optimism in 2019. The real estate sector is hot in Hawaii, accounting for 0.54% of growth in the middle half of 2018. Add in 0.51% in government enterprise, 0.31% in finance and insurance, and 0.44% in the retail trade sector growth, and it is clear those categories carry the most economic weight in the state. However, don't let the numbers fool you: Hawaii's financial future forecast does not fare well in some reports. If true, any growth the region sees will still remain below the U.S. average. Illinois boasts a $40 billion increase in GDP growth, even with its dysfunctional government. Though the Prairie State is surviving stronger than many others, it is still not out of the woods and could see a slowdown in the next two years. The state saw two negative quarters over the past two years but recovered late in 2018, despite a -0.33% fall in the agriculture, forestry, fishing, and hunting sector. Once known for its booming automotive industry, Michigan is still slowly returning from the 2008 recession. While GDP is now up—with the durable goods manufacturing sector being the strongest component at 0.48% in 2018—home ownership and household income is down. The labor force participation rate has fallen more than 7% since 2001. The Trump administration's national defense spending in the last two years has had both positive and negative effects on Maryland. In 2012 the state received 20% of its economy through Maryland's military sector; in 2017 the defense industry fed $60 billion into the state, led by Lockheed Martin. Oklahoma has seen its GDP grow by $10 billion under Trump. The economy has flourished through higher education and hopes to grow a gaming industry that currently puts 9.8 billion in the state's bank account annually. The wholesale trade and retail trade sectors collectively boosted GDP by over 1% while the mining sector contributed over $24 billion to the economy as the state's largest industry in 2018. The Granite State boasts a “robust economy” based on smart manufacturing, and that is borne out by the 0.69% contribution to GDP of the wholesale trade sector and the 0.38% rise retail trade posted late in 2018. A roller coaster 2017 finished with a -3.5% dip, but a steady 2018 had 24/7 Wall Street putting New Hampshire among the top five healthiest economies in the U.S. Though South Carolina experienced 5.74% growth in GDP, Democratic presidential candidate Sen. Kamala Harris contends that the Trump administration is costing the state in taxes. Taxes haven't affected the government enterprise sector, which claimed the highest percentage of growth, at 0.46%, in 2018. A $9 billion plan to spur the education and jobs market is currently up for debate. Florida's economy surged in 2018 thanks to a healthy real estate market and growth in wholesale trade, capping five straight quarter with over 3% overall growth. Florida will continue to see gains in the near future, primarily through international trade, tourism, and the space industry. How much the economy will suffer because of a ban on offshore drilling has yet to be determined, but it remains a real concern. Policies from early in the Trump administration helped keep GDP growing in 2017, including a 7.5% bump in the third quarter. The District's economy slowed in 2018, and the failure of Congress to pass a budget, in addition to the government shutdown, have left the immediate future somewhat murky. A friendly business climate and low unemployment have helped the Volunteer State's economy grow every quarter since 2015. The state saw positive growth in nearly every sector through the middle half of 2018, led by a 0.52% rise in wholesale trade. Nashville ranks 16th nationally among cities in adding jobs, and forecasts predict Tennessee will continue its winning streak. Finance and insurance was the leading contributor to growth in Utah, and one of the fastest-growing populations helped push it into the top 10 in GDP growth. The Beehive State ranked #3 overall among U.S. News & World Report's Best States. However, like many other states, Utah could get hurt by the looming Trump trade wars. The wholesale trade sector (0.68%) and retail trade sector (0.46%) were the biggest economic drivers late in 2018, so trade battles could hinder the state's economy. Things are looking peachier for Georgia: The information sector saw the highest GDP increase at 0.65% in 2018. Some of the $42.5 billion brought in can be directly attributed to Robins Air Force Base. While growth slowed toward the end of 2018, business expansion and a friendly climate for commerce suggests a bright future. Massachusetts' professional, scientific, and technical service sectors contributed the most to GDP growth in 2018 at 0.63%, with the information sector at 0.52%. That had an impact on the workforce, which averaged the highest population-to-job gains of any other state. The population is getting so large that state officials have proposed 135,000 new housing units by 2025, which is only going to help the construction component of GDP rise higher. Colorado comes in at lucky #7 for GDP growth of almost 8%. Billions have flowed into the state since cannabis was legalized in 2014, and Colorado is often a model for other states considering the economic gain from recreational use of marijuana. Aside from cannabis, other industries—including energy, tourism, and real estate—are assisting in the GDP rise that has brought in $27 billion since Trump took office. With a GDP in the trillions, California ranks as the world's fifth-largest economy. It is home not just to the world's entertainment capital, but to Silicon Valley, the engine of technological innovation A 0.43% bump in real estate shows how the “Republic of California” exhibits few signs of slowing down. When what happens in Vegas is an 8.62% rise in the GDP, then Nevada's good news is no longer private. Tourists continue to feed the economy, mostly visiting the Vegas Strip, and construction of new gaming-related facilities promises even more prosperity. With the highest GDP percentage for all sectors, at 0.57%, construction was the leading industry in the state. Among the top five, the Gem State seems to be shining as it boasts billions in added GDP. Retail trade growth at 0.6% in 2018 helped spur a $6.2 billion uptick in GDP; however, a national laboratory also contributes $2 billion to the state. NPR pointed out in 2017 that Idaho was considered the fastest-growing state based on a Census Bureau survey. Two years later, the state has the fourth-highest GDP in the country. Information services at 0.47% was the leading component of GDP growth in Arizona in 2018—the third fastest-growing state. Emblematic of its success, three of the state's zip codes rated among best places to live, suggesting that the hot state has plenty of cold hard cash. New York stands second in state economy wealth and health, thanks mostly to a 7% rise in GDP during the first quarter of 2017. The economy hasn't eclipsed 3.1% in any quarter since. The finance and insurance sector showed the largest rise to finish 2018 by contributing nearly a full percentage point. Ironically though, the New York Post recently reported that the most famous city in the world is on the verge of bankruptcy. Until that happens, the Big Apple remains the state's most fruitful economy during the Trump administration. Washington's economy tops the GDP charts thus far into the Trump Administration with growth of over 15%—the only state to break 10%. The economy has posted over 5% surges in four of the last six quarters. The information sector, led by the presence of Microsoft, posted nearly a 1.5% gain over the middle of 2018. Commitments to furthering education and one of the highest minimum wages, promise to keep the Evergreen State growing strong. Thus far in the Trump Administration, growth in the wholesale and retail trade sectors has been spurring state economies. Washington State has led the way, with a whopping 15% rise in GDP.